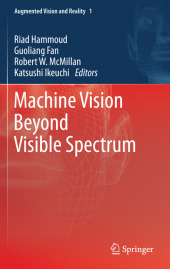 The material of this book encompasses many disciplines, including visible, infrared, far infrared, millimeter wave, microwave, radar, synthetic aperture radar, and electro-optical sensors as well as image processing, computer vision and pattern recognition. 1. Target Recognition in Infrared: Local Feature Based Person Detection and Tracking Beyond the Visible Spectrum.- Fuzzy mixture of Gaussians for the detection of moving objects in and beyond visible spectrum.- Dynamic Appearance Learning by Adaptive Kalman Filters for Robust Infrared Tracking.- Pedestrian Association and Localization in Monocular FIR Video Sequence.- Vehicle Matching and Recognition under Large Variations of Pose and Illumination.- 2. Multi-Sensor Fusion and Smart Sensors: Fusion of a Camera and a Laser Range Sensor for Vehicle Recognition.- Geometric Sequence (GS) Imaging with Bayesian Smoothing for Optical and Capacitive Imaging Sensors.- A System Approach to Adaptive Multimodal Sensor Designs.-3. Hyperspectral Image Analysis: Statistical Affine Invariant Hyperspectral Texture Descriptors Based Upon Harmonic Analysis.- Face Tracking and Classification Using Hyperspectral Video Sequences.- On near real-time moving Object Detection and Tracking in Multi-spectral Aerial imagery.